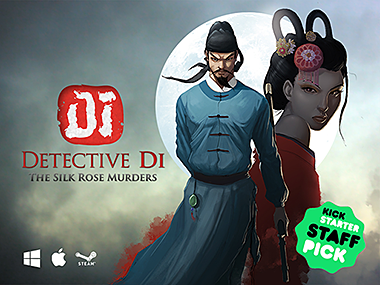 We’re very excited to announce the launch of our Kickstarter campaign for Detective Di: The Silk Rose Murders, a point-and-click thriller starring the legendary Di Renjie. Detective Di: The Silk Rose Murders is a point-and-click adventure game set in a world filled with mystery and charm and inspired by the classics of the genre–games like Gabriel Knight, Grim Fandango, and The Longest Journey. You play as Di Renjie (pronounced “Dee Ren Djieh”), ancient China’s most famous and gifted investigator, as he embarks on the trail of a serial killer in the heart of Tang Dynasty’s capital city. The funding campaign will run for 30 days from February 25th to March 27th with a goal of $16,000 CAD. A concurrent Steam Greenlight campaign has also gone live, and you can vote for it here. For press or media inquiries, please email us at info@nupixo.com. Posted in Detective Di: The Silk Rose Mruders.